Does the thought of going to this year's holiday party make you uncomfortable? Do you prefer to avoid those social outings where you don't know anyone (or not everyone)? According to the New York Times, 40 to 75 per cent of people suffer from social anxiety. In fact, it's the number one social fear. Does the thought of going to this year's holiday party make you uncomfortable? 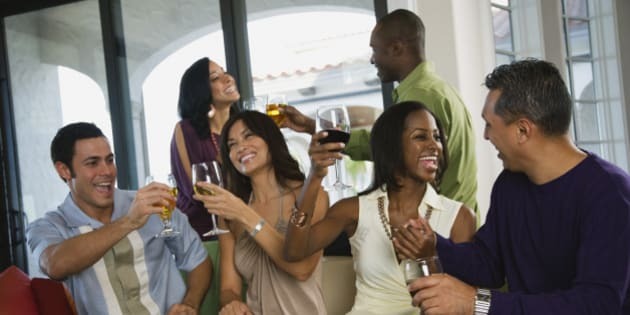 Do you prefer to avoid those social outings where you don't know anyone (or not everyone)? According to the New York Times, 40 to 75 per cent of people suffer from social anxiety. In fact, it's the number one social fear. Do you suffer from social anxiety? The Toronto Star reported that employers are placing more emphasis on social skills when hiring employees. They must have the ability to network and "schmooze." Even if you are uncomfortable, even if you don't know a single soul in the room, you have to move away from the comfort of the wall and be able to speak with others. Recently I was speaking at an event where I attended the entire four-day conference, speaking on the final day. I didn't know a lot of people, and since I hadn't spoken yet, they didn't know me, either. I found myself in an unusual position, feeling quite shy about networking. As I looked around the room, it appeared as though everyone knew everyone else, and no one knew me. Social anxiety overtook me. Since I am rarely shy and have no hesitation in speaking with strangers (pretty much anywhere) this was unusual for me. And I didn't like it. Of course, I knew what to do, but it occurred to me that there were probably many people at that convention of 1,200 people who were shy, and that many of them probably had no idea. Act as if it is your own party or gathering. Walk up to others and say hello. Don't wait for them to say hello to you (they might be shy). Make and hold eye contact with the person you are about to say hello to. Smile (seriously, some people forget the basics when they're nervous). Approach groups of three or more. Stay away from groups of two, unless you know one of them. If it's appropriate, extend your hand. Recognize that shaking hands is not universal, and don't be offended if they choose not to shake your hand. Don't wait for the other person to offer their hand, either (that is an outdated male/female custom). Stop moving if you wish to engage in conversation. If you say "hello" while on the move, your body language is telling the other person you don't want to chat. Watch your personal space! Although the music may be loud, be sure you aren't "in" the space of the person you are trying to meet. If you are trying to speak over loud music, stand beside the person instead of face-to-face. Don't keep looking over the shoulder of the person you are speaking to or at the door to see who else is coming into the room. Keep focus on the person you are speaking to (or you risk being considered rude). Once you've said hello the real networking (or schmoozing) begins. This is the small talk that makes many very uncomfortable. It is OK to be uncomfortable; the other person likely is as well. Be sure that it is appropriate to start a conversation, though. If you said hello to a person in a group and there was a conversation already going on, you have to be sure you aren't interrupting it. If the other person says hello but breaks eye contact to move back to their group and resume their conversation, move onto another group -- this one is busy right now. Take a moment and introduce yourself, and likely everyone else will follow suit. Say your first name clearly (slow down), put a smile on your face and make it look like you are a friendly person! "Hi, my name is Rhonda. Your name is?" "Hi, my name is Rhonda, and this is my first office party. Have you attended before?" "Hi, my name is Rhonda and I went to university with the bride. Are you here for the bride or the groom?" Simple, but it takes confidence (real or pretend) to get the ball rolling. After the introductions you can talk about where they work, the relationship that brought them there, the weather -- whatever seems appropriate. If this makes you nervous, think about these topics before you leave home. Keep the conversation going by asking short, open-ended questions. Don't interrupt and don't be afraid of pauses, either. This is uncomfortable, and it is even okay to joke about that. After a couple of minutes, it is okay to meet with other people, drift in another direction, or even introduce your new friend to someone else (even if that someone else is someone you had only met 10 minutes ago!). Move on and meet new people. Everyone is afraid of meeting the "leech" at networking events. If you've been chatting for more than 10 minutes, you have either met someone with whom you will make lifelong friends, or you are afraid to go meet someone else. Move on. Keep your glass one-quarter full. This gives you the opportunity to move on if you've met a bore, or it even gives you an excuse to leave the conversation. You should also hold a napkin, which can help for sweaty palms, too. Keep a positive attitude. Don't be a "Negative Nancy," regardless of the reason for the gathering. Negativity is very unattractive, and I don't want to spend time meeting someone who complains about things immediately! Standing and waiting for others to come speak to you is reminiscent of grade-school dances. I don't want to feel 12 again, so recognize that this feeling is very common and do something about it. It is far better to deal with the situation instead of waiting for someone to rescue you. You may never love entering a room and not knowing a soul, but at least you are wiling to do something about it! And remember: A gossip is someone who talks about others, a bore is someone who talks about themselves, but a brilliant conversationalist is someone who talks to you about yourself!